good to see all the athertons in neck braces after the accident. ive recently bought one too. great peice of kit. but there is obvs more to it then promoting leatt, the athertons were pretty shook up after the incident i reckon. They have money to buy neck braces they want we not ! Leatt braces coming into the bike scene in the last 3 years has been such a big change for the better! Nice to see the Pro athletes wearing them, it will influence a lot of people! Amazing picture BTW! 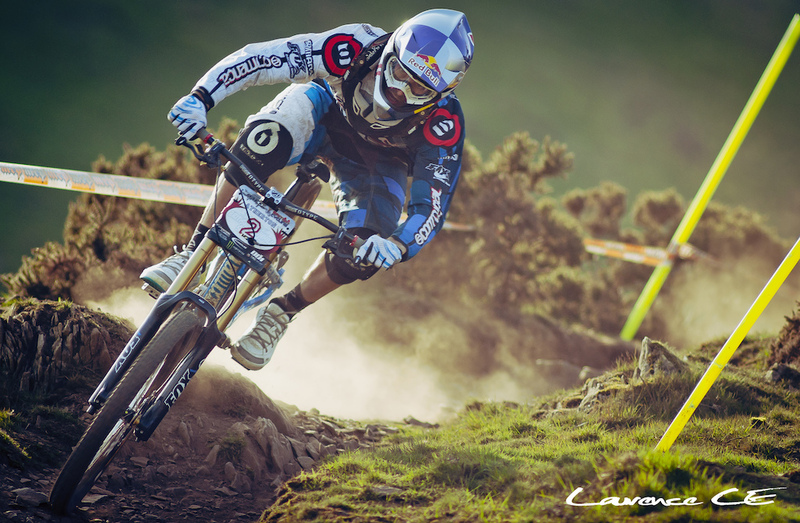 you are the Gee Atherton of photography !! Ahh... another insanely sick photo! yeh, spot on weekend, and spot on photo too! SOOO nice, do you use any flashes or any post to get the quality and effect? Teach me Laurence! One of the best PODs last days in my opinion! Gee looks so relaxed. Just out for an evening dh race? I knew this was going to be POD as soon as I saw it on the homepage yesterday. Amazing shot. Nice work. Seems like everyone thinks so because there are NO negative comments! Really good shot Laurence! You're just living the dream these days, hey? Props man, I always knew you were going to be one of the best! Sickest photo of moelfre I think I've ever seen! Huge props on that on pic Mr.
Man Laurence you've come along way! Props, this shot is great. Love the composition. Thanks man Appreciate the support. what shoes are the athertons running now?! because i've never seen anyone else wearing them. i believe he's sponsored by TKmaxx. agree to boylagz, much better with neck brace. Gee you´re the best !!!! so what kinda water you drinkin ? Wow, already pictures of Moelfre up, even better when it's POD! sweet pic dude what a rad day we had! Awesome... can't wait to get that bike! Gee man! Good to see with the brace, never hurts to be safer. where fullhd ? for wallpapers ? awesome photography, love the shot of brendan as well! sweet pic. Love colors and composition! Cool shot man, nice soft light. Were you using a filter? is it just me or has gee never used neck braces apart from now? Yeah they are all running them since Dan's crash last year. a bit close, but still a sick shot man! sick shot, anyone know what tyres gee's running here?